Bing may have a chance to gain market share against Google now that the partnership between the search leader and Mozilla has expired. For years, Mozilla’s Firefox Web browser has featured Google as its default search engine as the result of a profit-sharing arrangement. That deal and the popularity of Firefox resulted in a windfall for Mozilla that has fueled its success. More than three-quarters of Mozilla’s revenue comes from Google’s payments. Neither Google nor Mozilla have commented about the lapse of their lucrative deal, and they would not indicate whether the agreement would continue. On one occasion, a Mozilla spokesman observed that the company has agreements with several search engines; on another he suggested that negotiations with Google were in progress. Google and Mozilla began an amiable relationship long before Google launched a competing product. Now, the search giant has its own browser that has now surpassed Firefox in market share. By many accounts Chrome even outperforms Firefox, suggesting that Google might move in for the kill. By pulling its Mozilla’s financial lifeline, the search giant could bury its rival. Should Google and Firefox decide not to renew their financial arrangement, Mozilla would quickly face a perilous situation. Though the software developer’s reliance on Google cash has waned in recent years, it likely cannot survive without it. 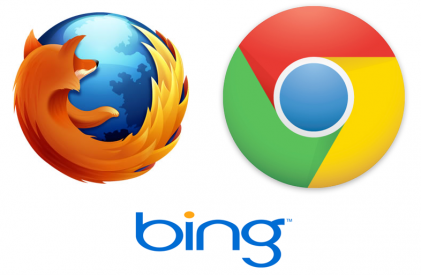 Devastating as it might be, the departure of Google from Firefox could leave a vacuum that could benefit a Google competitor like Bing. Though it commands a much smaller share of the search market than Google does, Bing has made impressive gains in recent years. Bing now powers the Yahoo search engine in a deal that gave it impressive traction in the marketplace. The search engine has also scored top search billing for several mobile phone products and minor Web browsers. If Bing became the default search provider for Firefox, it could make additional gains against Google. Despite its eroding market share, Firefox still can offer Bing an influx of millions of users who will willingly use their browser’s default search engine. Besides snatching users from Google, Bing could receive an advertising boon as a result of a deal with Mozilla. It would display more ads to more users, enabling Bing to compete against Google’s ad network. Right now, Firefox can deliver to Bing what it needs: users. Microsoft knows that. Neither Bing nor any other search engine will make significant gains in the market until the name “Google” is no longer synonymous with Internet search. To do that, Microsoft would have to swallow some pride and shell out cash to one of its arch rivals in the browser war. Firefox was among the first browsers to take on Microsoft’s Internet Explorer Web browser. It began the long parade of competing browsers that has rendered Internet Explorer almost irrelevant in the browser market. Although Microsoft’s animosity toward Mozilla might be understandable, the software giant should not pass up what could be a once-in-a-lifetime chance to grab millions of users away from Google. With an opportunity for both companies to gain from a deal, Mozilla should choose Bing as its default search engine. About the author: Calvin Hobbson is a technology enthusiast and car insurance broker in Toronto. If you’ve got a vehicle you’re probably in a similar situation to Firefox – you’ve got a car insurance company and an old deal. Compare some quotes online to determine the value you’re receiving. Mozilla Firefox is the browser I use. But I do not understand why should I use Bing as the default search engine… I will still use Google, because in my opinion it is the best. “To Bing or Not to Bing” this is the question. HAHA! In my opinion “not to Bing”. I will continue using Google. I agree with you. Perhaps if Mozilla will make Bing as its default search engine, they would have a chance of being as popular as Google.